Hearth 10th Anniversary Dinner Series: Fried Chicken Celebration feat. 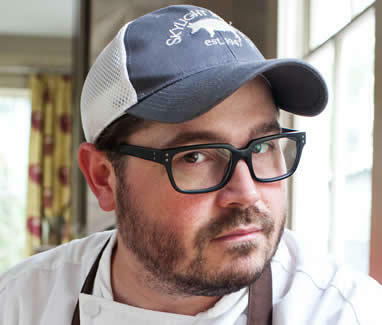 Sean Brock, Tue/Oct 15: This will be the first time the Husk & McCrady’s chef’s much sought after fried chicken will be available to the public. Brock and Canora will each produce an appetizer, entree and dessert for this three-course feast, including two different iterations of fried chicken, served family-style: brined in sweet tea and fried in five fats from Brock, and marinated in sage and lemon and pan-fried in olive oil from Canora. Seating between 6-10pm; $65/person (tax & gratuity additional), call 646.602.1300 to reserve. Hearth 10th Anniversary Dinner Series: The Food of Italy feat. Michael Tusk, Mon/Oct 21: Described by Canora as the “king of Italian cooking on the West Coast,” Quince Restaurant’s Michael Tusk will stop by the Hearth kitchen for a seven-course menu featuring Italian dishes from both chefs. Expect sunchoke sformato, agnolotti of squab and suckling pig and more. Seating between 6-10pm; $98/person (tax & gratuity additional), call 646.602.1300 to reserve. Hearth 10th Anniversary Dinner Series: Cook with Hugh Acheson, Tue/Nov 19: Southern fare will be the focus of this dinner with Georgia chef and restaurateur, Hugh Acheson. More details to come. The Hearth 10th Anniversary Dinner, Wed/Nov 20: The celebration will culminate with a special dinner featuring the dishes of 10 of Marco’s friends in the industry, including Tom Colicchio, David Chang and Karen DeMasco, with wine pairings from noted somms such as Aldo Sohm of Le Bernardin. Proceeds from the evening will go to the food bank at the nearby Lutheran Trinity Church as part of Hearth’s continued effort to support the local community. More details to come.